SRMJEEE 2018 (एसआरएम संयुक्त इंजीनियरिंग प्रवेश परीक्षा): The SRM University conducts the engineering entrance examination for the B.Tech admissions every year. The SRMJEEE notification 2018 has been published and the online applications for SRM Joint Engineering Entrance Exam 2018 will be accepted from November to the 03rd week of March 2018. Only the applicants meeting the eligibility norms in all the aspects are invited register themselves for SRMJEEE. The SRMJEE Application Form is available on the official website. There is approx 7000 Seat available for the undergraduate engineering applicant to enroll them into its four campuses – Kattankulathur, Ramapuram, Ramapuram Part Vadapalani and NCR Ghaziabad. Applicants will get the admission in the SRM University on the Basis of their SRMJEEE Cutoff 2018. The entrance exam will be conducted in April 2018 at its various exam centers. எஸ்.ஆர்.கே.இ.இ.இ.இ.இ.இ.ஆர்.சி. 2018 ஆம் ஆண்டுக்கானது. Srmuniv.ac.in என்ற முகவரிக்கு அனுப்பவும். एसआरएम संयुक्त इंजीनियरिंग प्रवेश परीक्षा ऑनलाइन पंजीकरण प्रक्रिया, सिलेबस, परीक्षा पैटर्न, स्कोरकार्ड, कटऑफ मार्क्स, मेरिट लिस्ट, परामर्श प्रक्रिया, सीट आबंटन के परिणाम यहाँ जांचा जा सकता है. All the eligible applicants will have to fill the Online Application Form of SRMJEEE 2018 on or before the last date, i.e. 03rd week of March 2018. 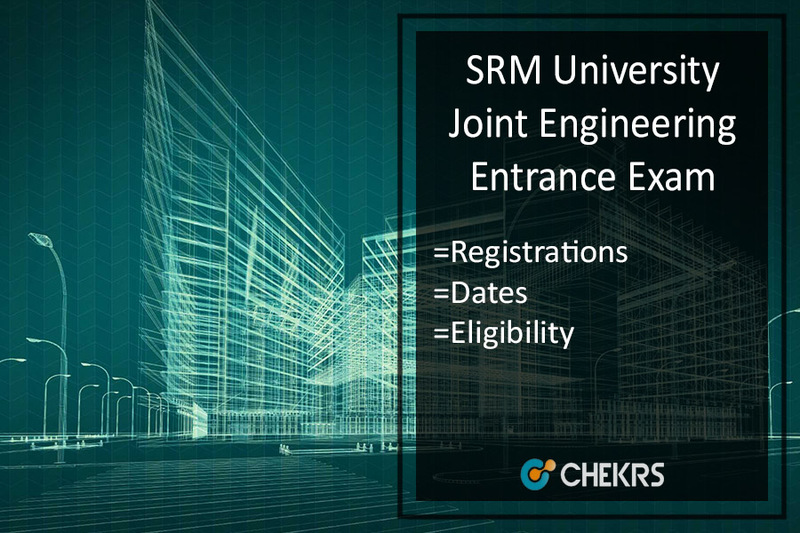 Applicants are advised to follow the below-given steps to apply online for the SRM Joint Engineering Entrance Exam 2018. Only the candidates meeting the eligibility norms in all the aspects are invited to register themselves by submitting the SRMJEE Online Form 2018. Get Register on the SRMJEE website. Fill the Online application form with no mistake. After that applicant has to upload the image. Take out the application for print out for the further uses. The applicant will get all the basic information of the SRMJEEE given as follow. Candidate can apply for the application but before applying for the application form application has to meet their eligibility criteria. Following are the Eligibility Criteria of the SRM Joint Engineering Entrance Examination 2018. Candidate should be an Indian for Admission. Candidate should pass their 10+2 from recognized education board with 65% aggregate marks in the subject of Mathematics, Physics & Chemistry. Following are the B.tech programmers which are offered by the SRM University to the applicant Programmers is given below. Following are the examination center of the SRM Joint Engineering Entrance Exam center which is given down. In this exam, the questions will be asked from the Chemistry, Math and Physics subjects only. The level of the questions will be on the basis of 10+2 standard. It is very necessary for all the candidates to be aware of the type and pattern of the questions that are asked in the SRM Joint Engineering Entrance Exam. Candidates are advised to check the complete details about the SRMJEEE Subject Wise Syllabus 2018 by following the direct link given here. The Exam will be held in the online mode. The question will be asked from Physics, Maths and Chemistry subjects. Total No of the questions will be 105 questions, 35 questions will be asked from each subject (PCM). 2 Hour 30 minutes will be provided to solves these questions. Through the sample papers, the applicant can score very good marks in their SRM Joint Engineering Entrance Exam. The applicant will get the sample paper here in this article after the official announcement of SRMJEEE entrance examination. Sample paper also helps to the applicant know that was and in which subject they are comfortable. Sample paper helps to the candidate to prepare for the examination. Candidate will get the SRMJEEE 2018 Admit Card after filling the application form successfully. The admit card will be released online on the official website in the last week of March. Candidates are advised to follow the given link to check the SRM Joint Engineering Entrance Exam Hall Ticket 2018. Through the Admit Card applicant will know about the examination center name and place of the entrance exam. Applicants have to keep in the mind that they have to carry their SREMJEEE Admit Card/Hall Ticket along with the photo identity card in the examination center. The candidate has to read all the instruction very carefully which is providing by the SRM University to the applicant. The selection of aspirants will be on the basis of SRMJEEE Examination 2018 for new admission. The Seat Allotment of SRMJEEE 2018 will be held by the counseling process. Selected students those pass the exam, they need to fill the counseling form. The exam community will provide the seats to the candidates according to their performance in the exam. After counseling process, you need to complete the admission formalities by visiting the Institute.